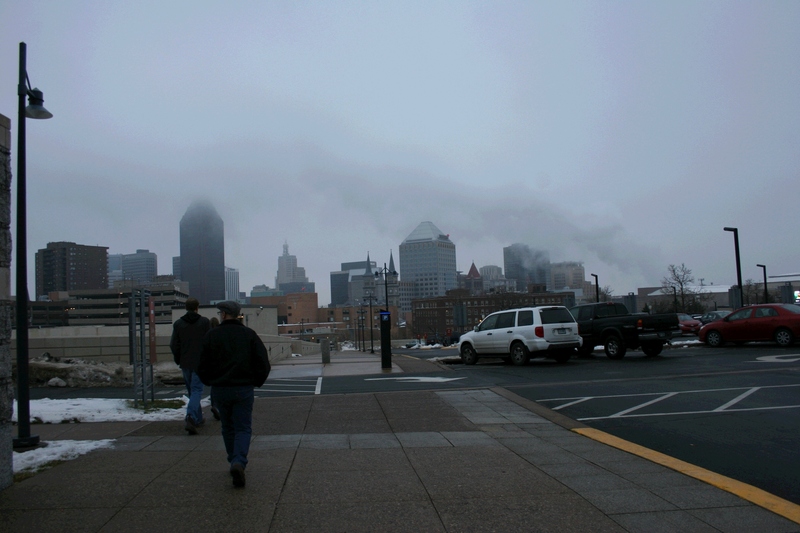 GREY DRIFTED OVER THE CITY, layering an eerie mood over downtown St. Paul on a late November Saturday afternoon. The temp had warmed to hurry from your car to building without a coat warmth as my husband, eldest daughter, son-in-law and I exited the Minnesota History Center. 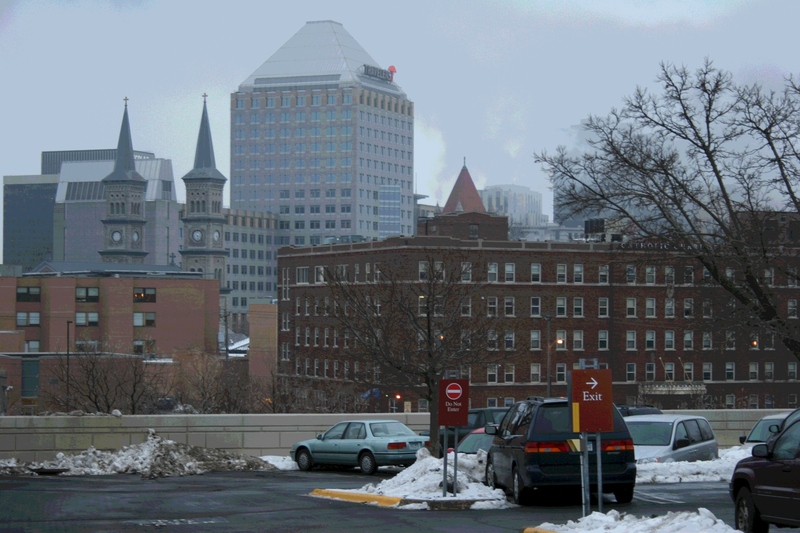 As we aimed toward the parking lot facing the St. Paul skyline, double church spires drew my eye. So did the red umbrella marking Travelers Insurance. And because I do not know this city well, I could not identify the other buildings in my view except Catholic Charities, marked as such. But that mattered not, for in that moment angles and fog and mood mingled into a scene worth photographing. The writer in me was already formulating the plot for a Capitol city mystery, inspired perhaps by the Nancy Drew board game spied inside the History Center. The red tile roof in the distance is the Landmark Center. It is a very interesting building. Renovations of the exterior have been going on for months. The two spires look like the Church of the Assumption. Love downtown St. Paul. I figured you could ID more buildings. There’s such a contrast b/n the Twin Cities. Minneapolis looks and feels so much more “big city.” That’s why I like St. Paul. The feel in that river city is more earthy, more historic, more aged, making it more appealing to this girl of the prairie. This is what it looks like outside my window today. Gloomy and gray but hey—the sun always comes up, right? Ever the optimist and one of the reasons I love you so. Your observations of St. Paul are what make the “marriage” of the Twin Cities so perfect! One, a cutting-edge, forward-looking modern skyline and city;the other, a beautiful preservation, with modern updates(! ), of the historic……totally charming! Rice park, with its Ordway Theater at one end and the St. Paul Hotel at the other, form a twinkling fairyland (especially in Winter). Although, it’s far from being the town I grew up in, St. Paul still maintains its majestic status with the prized Capitol standing guard on its northern vantage point. Well written from the perspective of a native. I’ll second that. I grew up near Selby-Dale and remember hearing six languages spoken on every corner. Back then, we had a lot of DP’s which is what we called Displaced Persons in the aftermath of WWII. How little has changed? Minnesota has always been home to refugees. The east side where I worked for years is home to the Hmong. The German parish where I went to high school is Burmese. Even down here in Southern Minnesota, we have Sudanese, Burmese, Somalian and Ethiopian communities. You certainly had a much more diverse upbringing than me, where we were mostly all either of Scandinavian or German ethnicity. Lutheran or Catholic. And mostly all from farms. At least in my circle of family and friends. Thankfully the populations in Southern Minnesota have become much more diverse. These days we see diversity as race and ethnicity – but that ignores an important part of our history and blinds us to the progress we have made. A half century ago, the line that divided us was not race or ethnicity but religion. In the neighborhoods of large cities and in small towns, people segregated themselves by religion. It often determined who your friends were and who you were allowed to go to a dance with. When I was five, I hung out with a black kid. My parents had no problem with that – until they found out his parents were Baptists. How far we have come, promises great things for the future. Yes, religion was the great divide back in my growing up days. And I grew up on the “East Side”/near Maryland & White Bear Ave. Very post-war new development in our area. It was still mostly pasture/hay field when we moved into our new ’49 house. Selby-Dale was a “world” away (the 1st 5 years of life was spent on the West Side/across the “High Bridge”! So glad you stopped by and taking the time to comment on my comment!!!!! This is what I especially enjoy about blogging, this community of readership and discussion. LOL! I do believe there’s a separate dialog goin’ on here!!! Hehehe!!! Maryland and White Bear, eh? I just retired from the Minnesota Bureau of Criminal Apprehension. We were located on Phalen Blvd and Maryland. It is a very different world now from the one you grew up in. Some good and some bad – but you should stop by the Hmong Village on Johnson Pkwy a block of Maryland to get the best bowl of Pho in the Twin Cities. Thank you and I take that as a sincere compliment from a country girl. The dark glass building on the very far left of the second photo is Ecolab University Center. My office is located on the 6th floor. Well, now I know where you work and quite near Marc. Dan Truan is right that those two spires are Assumption Catholic Church. That’s the church my dad went to when he was kid! I need to get inside that church. It’s beautiful from the exterior. I can only imagine the interior. I actually prefer St. Paul over Minneapolis, we got to know this beautiful city when Brice was attending the College of Visual Arts on Summit Ave. 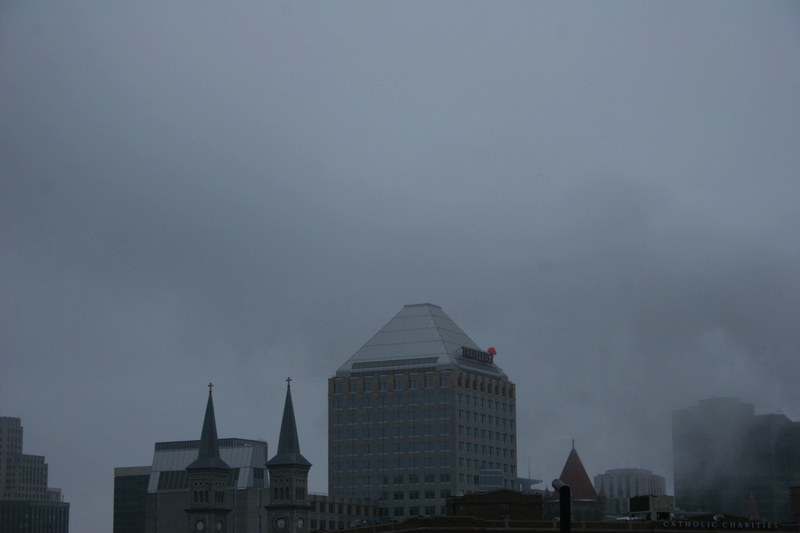 They gray skies are starting to eat at me…. Some sunshine would be nice, soon I hope! And what about all that snow which has melted? Not an unexpected comment coming from you, Jackie. Cheer up. It will snow soon enough. I just don’t want any snow falling when we need to travel for the holidays and when my kids need to travel. We had a beautiful day here, in the 40s. People in shorts. No need for gloves or hats. Snow melting. And, late in the day, sunshine peeking through the grey. I have always heard that Minneapolis was the city for being wild, dating and looking for a mate, and St. Paul is the city where you raise your children to play. St. Paul really is more of a small town as far as cities go, but I find it very difficult to find my way around. This gray is getting a bit old, but I love the warmth! Now that’s an interesting perspective. But I remember my daughter saying she would never live in St. Paul, where she works. She was single at the time and living in Uptown in Minneapolis. Now she’s been married a year and lives in a burb b/n the the Twin Cities.